The French Wine Regions can produce a variety of fine wines. No other country produces wines of this volume or historic nature. French wines are still the benchmark used for fine wines around the world. To learn more about French wines we need to explore the regions where they are produced. France was the first country to develop a special coding for labeling and evaluating wines. This is called the appellations d'origine controlee (AOC). The AOC rating is important in determining the range and style of wines. French red wines typically do not label the red wine grape used to make the wine but instead list the region and Chateau who produces the final product. Many wine regions and wineries have developed such a stellar reputation that one only needs to see that it comes from a particular area of France to know the quality and style of wine. The most popular french red wines are the Bordeaux, Burgundy and Beaujolais. French wine regions are divided by major red wine producing area. They are : Bordeaux, Burgundy, Rhone, Languedoc-Roussillon, Loire and Alsace. However the French wine regions of Loire and Alsace are predominately white wine regions and will not be explored in our red wine passion website. Bordeaux is considered to be the most prestigious wine producing region in the world. Bordeaux has more wineries producing high-quality red wines than any other area in the world. Ideal climate and soil conditions play a large role in the fine wines of this area. The climate tends to be stable and moderate in temperature. The vines and the viticulture spans over 200 years making the wineries and family owned Chateaus very knowledgeable and experienced. 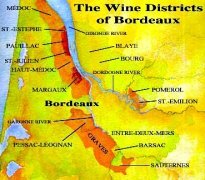 This famous wine region of Bordeaux is divided into two major areas. Red wines from this area are big tannic Cabernet Sauvignon style with heavy black currant and black cherry flavors. These are my absolute favorite style of wines. Capable of aging for many years, they are perfect for your wine collection. A wine collectors dream come true. Look for these Chateaus listed on the label of some of the finest Bordeaux wines available. The wines of this area are less tannic and more fruit forward than those in the Left Bank. Visit here to learn more about the red wines of Burgundy and Rhone.